Wednesday October 16 1907 I was busy what time I had in the morning cutting out night shirts for Will. He took a calf down town he sold. I kept on with my sewing the rest of the day. Fannie went to Marshalltown early this morning one of her Aunts there died very suddenly Weather very pleasant. Thursday October 17 1907 It was a fine day. Our threshing was done this morning before eleven oclock. We had 360 bushel of oats. Ott went to Marshalltown for the day. I went down town with Will in the buggy. I stopped at hime to visit with Callie McCallister who was there for the day. It was 12 years today since Charlie died. Wrote to Lydia. 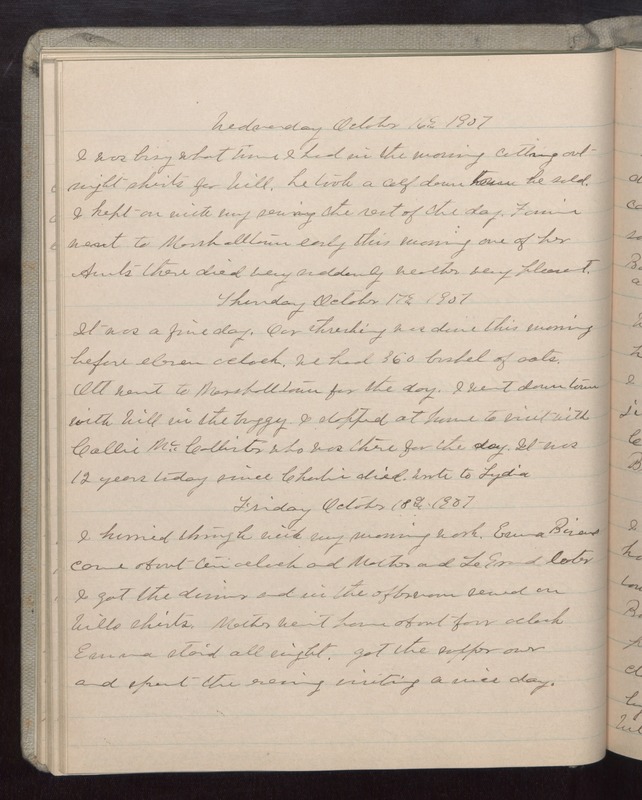 Friday October 18 1907 I hurried through with my morning work. Emma Bivens came about ten oclock and Mother and LeGrand later I got the dinner and in the afternoon sewed on Wills shirts. Mother went home about four oclock Emma staid all night. got the supper over and spent the evening visiting a nice day.